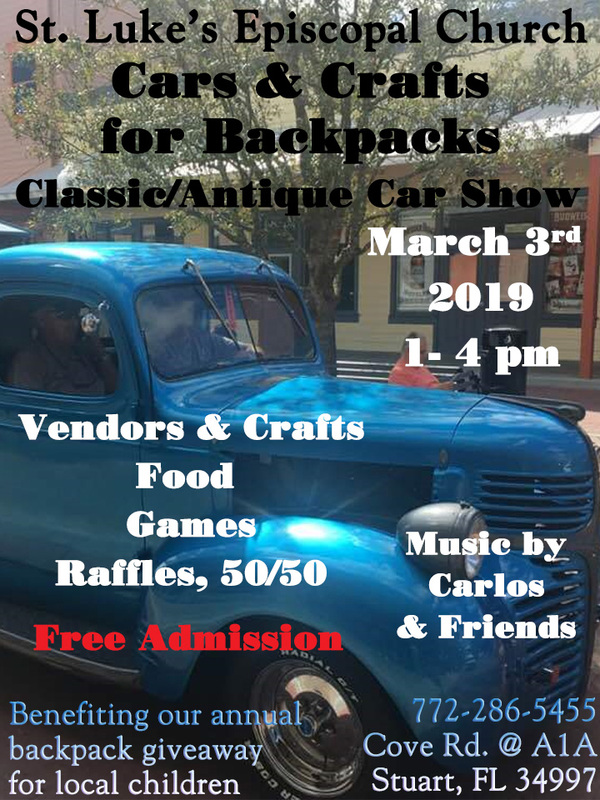 St. Luke’s Episcopal Church will hold Cars & Crafts for Backpacks show on Sunday, March 3, 1-4 p.m., at the church, 5150 S.E. Railway Ave., Cove Road at Dixie Highway, Port Salerno. Included will be classic/antique cars on display, food for sale, vendors, 50/50 raffle, Sponsor A Child (for a backpack for $20 per child) and games for children. Music by Carlos & Friends. Proceeds will go to the church’s annual backpack giveaway in August. Backpacks with school supplies are distributed at the church in August to area children. For more information, call 772-286-5455.